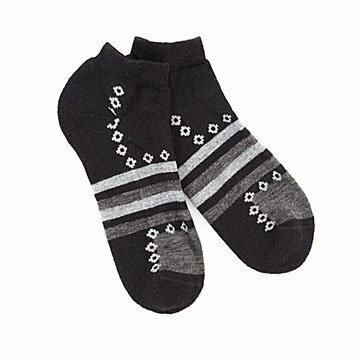 Cushy, warm, and silky-soft, these terry-bottomed anklets are hand-knit from Peruvian alpaca fleece. Alpacas' super-soft, silky fleece has unique thermal properties that keep the adorable beasts comfy in their native Peruvian Andes highlands, where hot, sunny days are followed by freezing nights. Less allergenic and less bulky—but twice as warm—as sheep wool, durable alpaca wool wicks away moisture and is naturally lanolin-free and non-scratchy. Ideal for running and outdoor sports, the terrycloth bottoms and lower sides of these anklets offer superior absorption and cushioning, while the lighter weight upper keeps your feet cool during your exertions. Made in Peru.